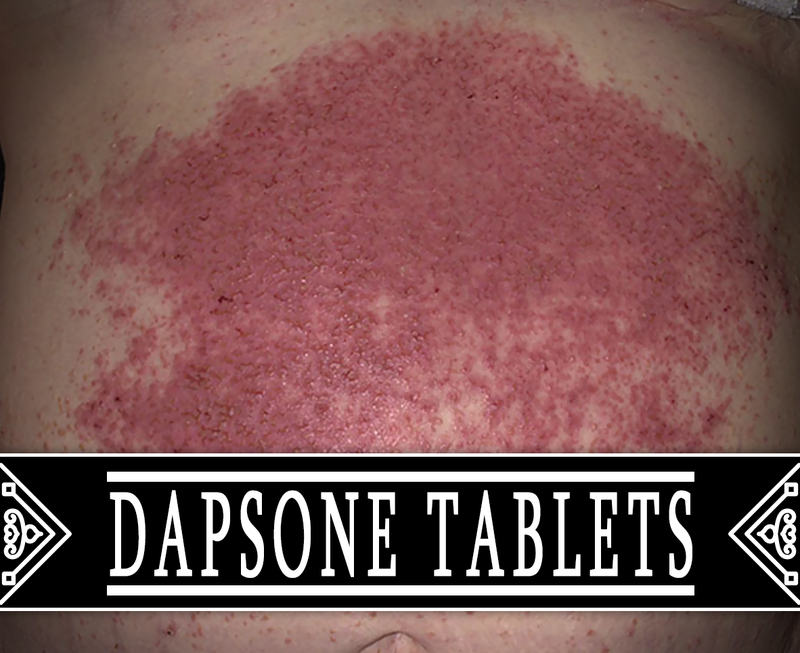 Dapsone Tablets are used to treat a certain type of skin disorder called dermatitis herpetiformis. This may also be used with other medication to treat leprosy. In treating leprosy, this is used along with other medications for at least 6 months. In some cases, the medication may need to be taken for many more months or years. How do Dapsone Tablets work? As an antibacterial, this medication prevents bacterial synthesis of dihydrofolic acid. It is through competition with para-aminobenzoate for the active site of disydropteroate synthase. Though structurally distinct from Dapsone, the sulphonamide group of antibacterial drugs also work in this way. You may have to take it every day for as long as 3 years or more or for life. If you stop taking this medicine too soon, your symptoms may return. This medication works best when there is a continuous amount in the blood. Dapsone Tablets belongs to the class of medications known as sulfones. It is a white, odorless crystalline powder, and practically insoluble in water. This tablet has the strength of 25mg and 100mg for oral administration. The Food and Drug Administration (FDA) has approved this treatment. How to use Dapsone Tablets? The recommended dosage for Dapsone Tablets depends on your condition and response. This is usually taken once a day. You may take it with or without food by mouth with a full glass of water. Use this medication regularly to get the most benefit of it. To help you remember, take it at the same time each day. Do not double the given dosage to avoid some complications. Let your doctor know right away if your condition worsens. What are the side-effects of Dapsone Tablets? Before using this medication, inform your doctor if you have any allergies, medical history, or current treatments. This is only used in pregnant women when clearly needed. If you are breastfeeding women, consult your doctor first. Keep this away from the reach of children. Keep this also away from the heat and moisture.